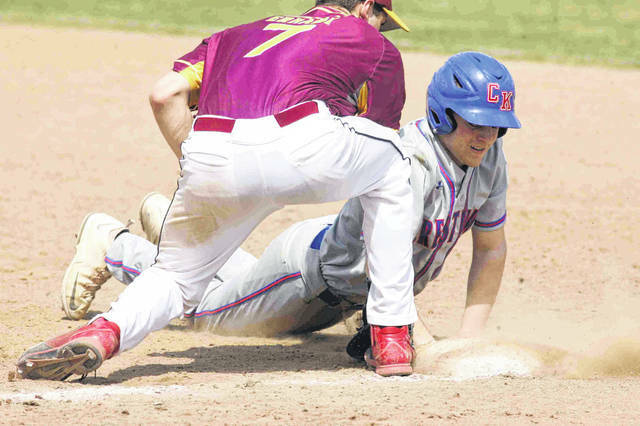 Kalida’s Luke Erhart slides safely into second base as Crestview’s Logan Geradot fields the high throw during Saturday’s game at Kalida. Josh Recker pitches for Kalida during Saturday’s home game against Crestview. Crestview’s Riley Saylor gets back to first base safely before Kalida’s Luke Erhart can tag him out during Saturday’s game at Kalida. 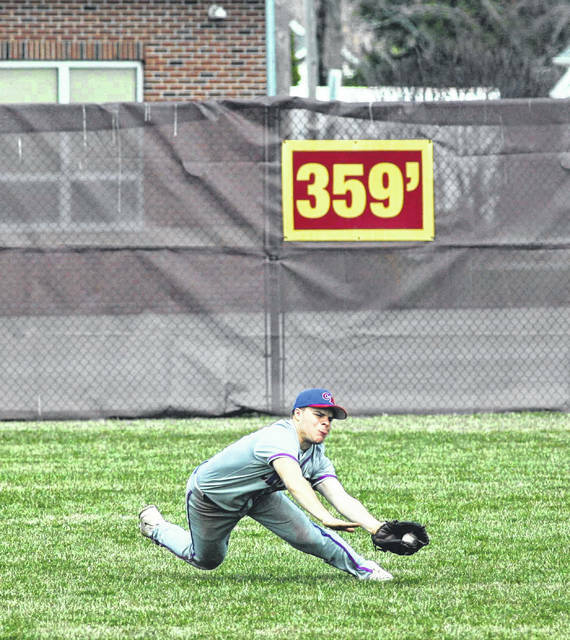 Crestview’s Riley Saylor makes a diving catch in center field during Saturday’s game in Kalida. 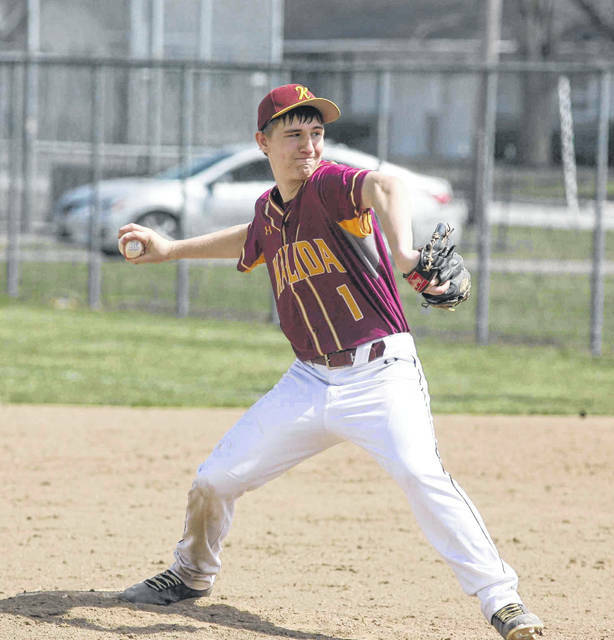 KALIDA — Kalida right-hander Josh Recker was spot on in leading the Wildcats to a 10-1 victory over Crestview on a pleasant Saturday afternoon in non-league baseball action at Holy Name Ballpark. He gave up seven hits and an earned run, while walking one and fanning eight in his 99-pitch (69 for strikes) outing. 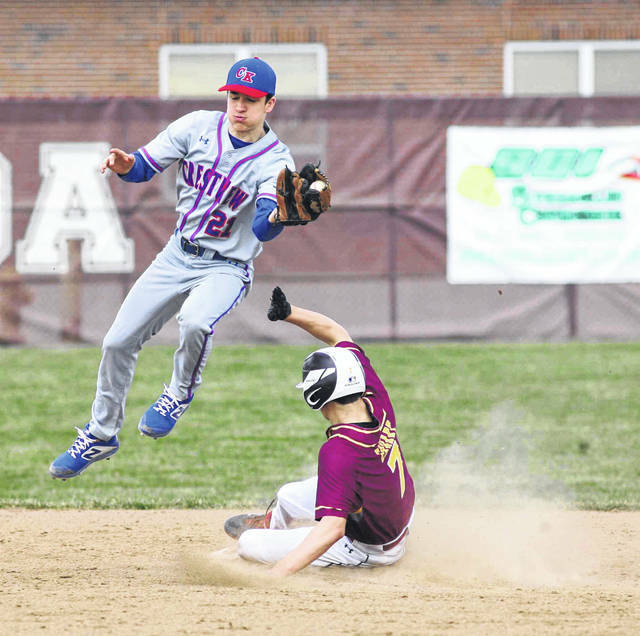 The Wildcats (4-0) got all the runs they needed in the bottom of the second inning against Crestview starter Griffen Painter (two innings, four hits, one base-on-balls, one strikeout, four runs, one earned). With one down, Recker walked and Tyler Klausing singled to left. Recker was caught trying to steal third by catcher Korbin Hartman for the second out, with Klausing swiping second. Matt Kehres was hit by a pitch, Gabe Hovest beat out an infield hit to third and when no one covered home, Klausing scored for a 1-0 edge. The Knights’ defense misplayed Zach Vonderembse’s fly ball for a two-base error, plating Kehres and Hovest. Luke Erhart singled to center to get Vonderembse home for a 4-0 edge. Crestview (1-4) got its lone run in the top of the third. Riley Wilson doubled to right, moved up on a wild pitch and scored on Logan Gerardot’s single to center for a 4-1 scoreboard. Kalida put it away with a six spot in the home fifth. An error on a grounder hit by Erhart (3-for-4) started it against reliever Kaden Short (2 2/3 innings, 1 hit, four walks, six unearned runs) and he stole second. Owen Recker walked and two errors on Ethan Lambert’s grounder plated Erhart for a 5-1 lead, putting Owen Recker at third, from where he scored on a single to left by Trevor Lambert. Ethan Lambert was out trying to advance on a wild pitch for the first out. Josh Recker walked. An out later, Kehres got aboard on an error, with Trevor Lambert scoring for a 7-1 lead. Hovest was safe on an error on his grounder, loading the bases. Josh Recker scored as Vonderembse walked for an 8-1 edge. Kehres scored on an infield single by Erhart and Hovest scored as Owen Recker was hit by a pitch for the final tally. This entry was tagged kalida. Bookmark the permalink.